A promo card from Animedia for Christmas 2004. This is the best I could get the scan from a 2.5" x 3.5" card but it's still a very adorable image. 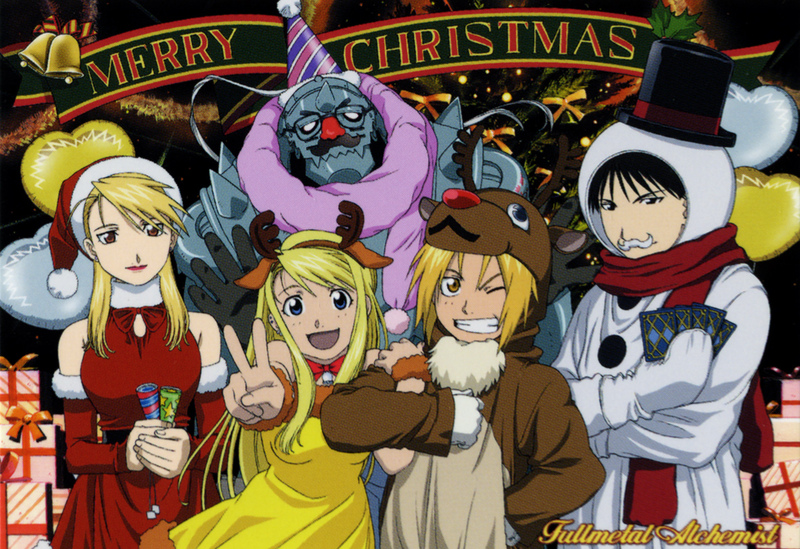 A bit blurry but a rare FMA christmas scan! I prefer the gold version. The coulors are great and they blend perfectly with the scan. Omg! The wallpaper is very nice and cool. i like it very much! thanks for sharing it to us. I love this pic, and glad to finally have a better version then the one I have!. LOL! roy mustang.... hahahaha. what's he supposed to be? this is just so adorable! They all look so adorable! It is a bit blury, but my scanner would have runined it if I had tried to enlarge it so much. I get everyone's costume except Al's. Ed and Winry are reindeer, Roy is a snowman, and Riza is Mrs. Claus, but what/who is Al? No big matter, he's adorable all the same! Whee! What a funny cute image! Oh my! Look at Roy and Al! XD So adorable. Yay for sharing this! That ain't sugar free that baby's sweet. Thanks! SQUEEE! SOOO KAWAII! Thanks for sharing, adding to faves! hehe it realy good funny and awesome! can somebody send me some of fullmetal scan in my email add? That is so funny! I love Roy, and I looooove Riza! Wow they all look so cute *.*. It makes me so happy to see this. And it's near chistmas for me. Good picture. It's very well drawn. this one is new! lmao... roy got stuck in a snowman getup. XD very cute! Great Christmas picture. Great scan too especially considering the size of the source. Thanks for your time and effort on this. They're greatly appreciated. Thanks!